The SureColor P800 can connect directly to your computer using USB and become part of a local network using the built in Ethernet connection. 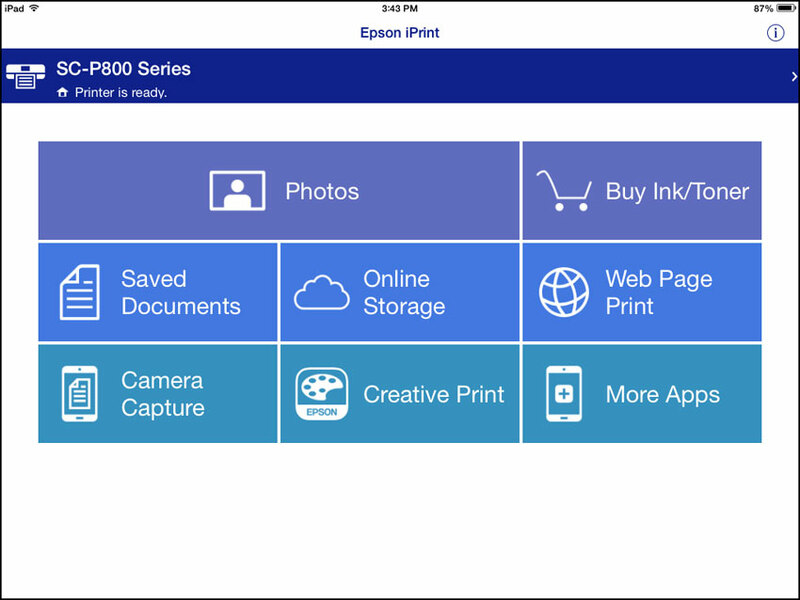 To make the printer more fun and useful, Epson has also provided several ways to print from your smartphone or tablet. Connecting the printer to a Wi-Fi network is but not necessarily required, depending on the option you choose. I’ll give an overview of the available options and share the results of those I was able to try first hand. The first step in using any of these is getting the printer connected to a Wi-Fi network. This can be done from the LCD display on the SureColor P800. There is a special icon that takes you directly to the printers Wi-Fi settings. The Wi-Fi Setup Wizard will show you all the available networks. Choose the one you want and enter the password for that network using the soft keyboard on the display. That’s it! AirPrint was introduced with OS X 10.7 (Lion) and iOS 4.2 for printing via Wi-Fi to an AirPrint enabled printer. Having your iOS device and the printer connected to the same wireless network is all that is required since AirPrint doesn’t need any printer specific drivers. 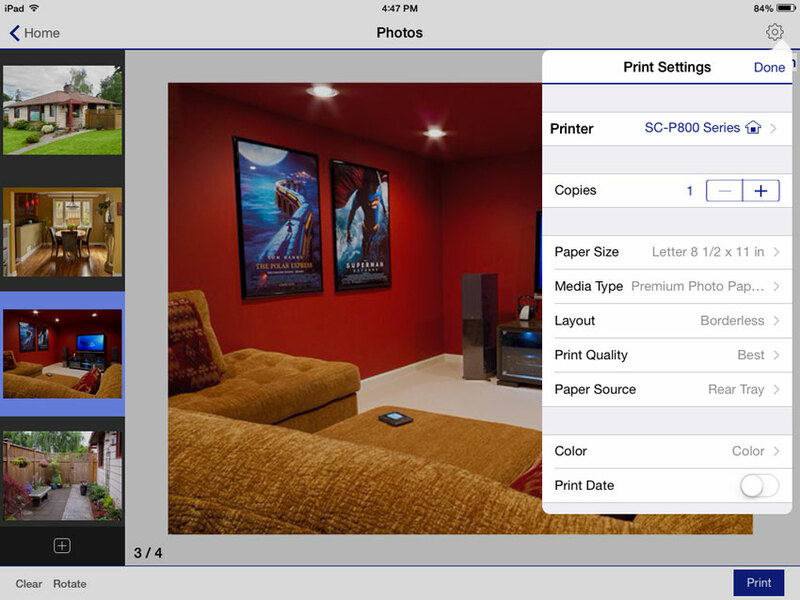 While I could easily print a text document from a variety of applications on my iPad, I was most interested in printing from “Photos”, the iOS application used to display digital images on the iPad. Once you select an image to print in Photos, touch the sharing icon (it’s the little box with the arrow pointing up). Touch the “Print” button on the sharing menu and you are using AirPrint. The printing dialog box shows which printer(s) are on the network and gives the option to choose the number of prints you’d like. It also tells the size of the paper (if any) is loaded into SureColor P800. In an earlier post I questioned why the LCD touchscreen on the SureColor P800 lights up when you insert paper into the sheet feeder, asking for the type and size of paper being loaded. This information is important if you are printing from a smart device. The printer uses this information to properly render color and inform AirPrint what print size you want. 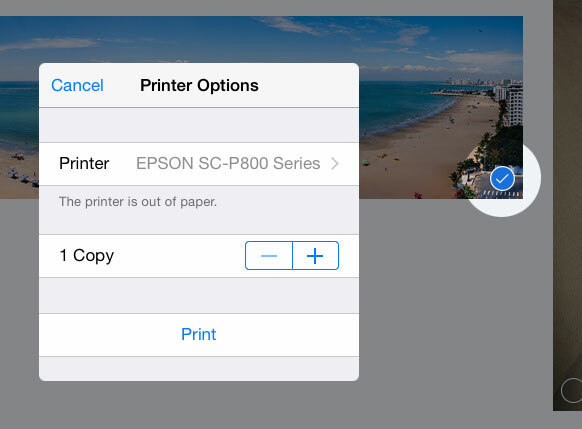 If you never see yourself printing from a phone or a tablet, this feature can be disabled. If you like borderless prints, AirPrint is for you. Since there are no sizing options within AirPrint, any image you send to the printer will fill the paper you have loaded into the printer. If the shape of your image isn’t a perfect match for the paper size, some cropping around the edges will occur. While the functionality of AirPrint is limited, the color and contrast of the prints were surprisingly good. This is a feature that lets you send images from your smart device to your printer even if you are on the other side of the planet. Once your printer is registered with Epson’s online email server, your printer is given an email address of its very own. This would be great for sharing images remotely with friends, relatives, or colleagues back home. Unfortunately, each time I attempted to register the SureColor P800 using the software provided I got a message that the service was not available. The manual claims the SureColor P800 is capable of using Epson connect. Your results may vary. Photos and documents on your smart device. Images you have stored in Dropbox, Evernote, Google Drive, etc. In addition the images stored on my iPad, connecting to my Dropbox account using my email address and password gave me access to all the photos I have stored there as well. Epson iPrint supports Microsoft Office files, PDF, JPG, GIF, TIF, BMP and PNG. The PSD files didn’t work. Once you have chosen which image(s) you want to print, Epson iPrint gives you lots of options. Pick from 27 print sizes and 11 Epson paper surfaces (matte and glossy) with or without borders. You can also preview and print your images in black & white. Once you have chosen your paper size, Epson iPrint lets you pinch down the image to include all of the edges. This may leave uneven borders but none of the image will be cropped away. You can also zoom in allowing you to deliberately crop the image and reposition it within the frame. The results, again, were surprisingly good. Sometimes a wireless network isn’t available. 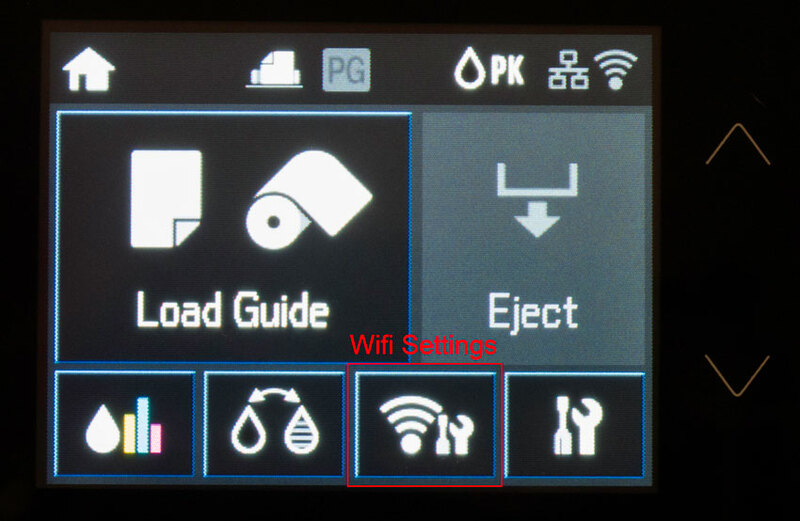 Creating a direct connection between your smart device and the SureColor P800 starts with the same button on the LCD display used to access the Wi-Fi Setup Wizard described earlier. Wi-Fi Direct Setup (located at the bottom of the Wi-Fi Setup menu) also has a connection wizard that takes care of most of the work. It creates a private ad-hoc network for you, and then displays the name and password. You connect your smart device to this private network as you would any other wireless network. You can expect the same functionality you would have if the printer were on a conventional wireless network. The only downside is that you won’t be able to access your cloud storage (Dropbox, Evernote, Google Drive, etc.) since your one Wi-Fi connection is being used to talk directly to the printer. Would I lay down my hard earned money for this printer? Absolutely. The SureColor P800 is definitely an improvement over its predecessor, the Stylus Pro 3880, in terms of its general construction, color gamut, and overall design. I love the idea of being able to make a print of any size between 4x6 inches and 17x22 inches. The variety of papers available for this printer is staggering. Because the ink tanks are so large, it’s more economical to use than the 13-inch Epson printers and doesn’t take up near the desk space a Stylus Pro 4900 would require. I didn’t even get into how well the Advanced Black & White settings in the driver work. Some users of earlier models may not like the new way of loading fine art papers. I understand that. The method chosen for the SureColor P800 is slower but I didn’t have a single miss-feed or a moment of frustration around loading fine art paper, roll paper, or any other paper. This raised my level of enjoyment and, to me, that’s patience well rewarded. Dennis Haley at Digital2You can arrange a demonstration for you at the new showroom and demo center. He has more information than I do about the SureColor P800. He has more of them, too. Make sure to clean out your vehicle before you go. After you see the SureColor P800 in action, you’re going to want to take one home.